Zarek is the most dangerous of all the Dark-Hunters. He endured a lifetime as a Roman slave and centuries as a Dark-Hunter in exile. Because of his steadfast denial to follow any orders, he is kept in isolation in Alaska where his activity is limited and closely monitored. There are many who fear he will one day unleash his powers against humans as well as vampires, and that nine hundred years of exile have made him too vicious to be redeemed. The gods want Zarek dead but reluctantly agree to allow justice goddess Astrid to judge him first. Astrid has never judged a man innocent, yet there is something about Zarek that tugs at her heart. He views even the smallest act of kindness with shock and suspicion. But while Astrid struggles to maintain her impartiality in the face of her growing attraction to Zarek, an executioner has already been dispatched. I'm so pleased that I'm finally getting around to reading this series because I'm enjoying every minute of it. I knew when we met Zarek in Night Embrace that I was going to love him and I wasn't wrong, learning about his past in Dance with the Devil broke my heart but I now have a new favourite tortured hero! I don't think I've ever come across a hero with such a horrific background (not even Zsadist!) so it is no wonder that Zarek doesn't trust anyone. He deliberately puts on a cold outer shell to prove that he doesn't need anyone and that he is fine all on his own. He pushes people away before they can hurt him because nobody has ever shown him any kindness. Even since he became a Dark-Hunter he has been ostracised by the others and he has spent hundreds of years exiled in Alaska with very little in the way of physical comfort let alone any emotional connection. How Zarek isn't completely insane is beyond me but in spite of the way he has always been treated he has clung stubbornly to life and refused to just give up and die. Nobody has ever taken the time to push past his defences but in spite of that he shows a caring side in the way he secretly looks out for others. Not that he'd ever admit to the nice things he does because he wouldn't want anyone to think he had a softer side! The only person who has ever fought for Zarek has been Acheron but you could hardly call the two of them friends. Zarek resents the fact that Ash is his boss and able to order him around and he doesn't trust Ash to have his best interests at heart. Even though Zarek keeps him at arms length Ash does his best to protect him and when Artemis decides it is time for Zarek to die Ash makes a bargain with her to save his life. Artemis agrees to stand by the judgement of justice nymph Astrid knowing that Astrid hasn't found anyone innocent in her thousands of years as a judge. Astrid fully expects to find Zarek guilty but when she starts to spend time with him she sees the inconsistencies in his character, the fact that he could so easily have attempted to hurt her but that even though he is snappy and angry he actually goes out of his way to help her. She is the first person to take the time to get to know him properly and see just how hard his life has been. She doesn't pity him but instead admires his will to survive and she comes to respect the man hidden deep inside. I just want to say how much I loved these two as a couple, their banter was hilarious and I liked the fact that Astrid just kept on pushing him out of his comfort zone trying to get a rise from him. She is the only one who is willing to call him on his behaviour and that makes him want to trust her. Their relationship builds slowly and was so sweet to watch, I loved seeing how he reacted to her and my heart melted when he finally starts to believe in her. 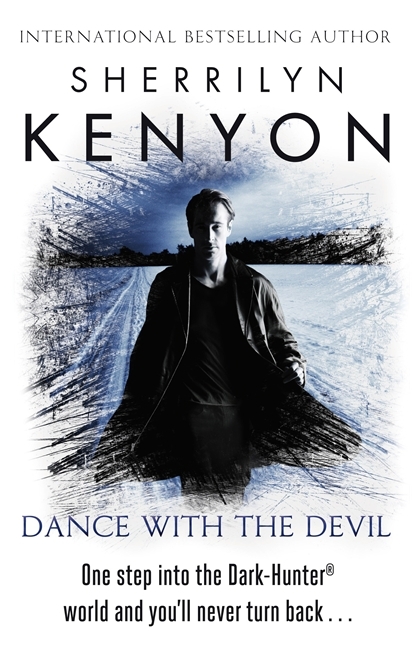 Dance with the Devil was hard to read at times, reading about Zarek's past had me in tears (this book should definitely come with a tissues needed warning!) but there were also laugh out loud moments and a lot heart melting romance. I haven't even mentioned the other characters yet but I loved the scenes with Ash (he's definitely a hero I can't wait to spend more time with), Simi is hilarious and I hope we're going to get a book about Jesse at some point. I'm also very curious about Astrid's friend and companion Sasha. I can see why this series is so popular and I'm looking forward to continuing my reading binge with Kiss of the Night.